This is a book of eight short stories and novellas. 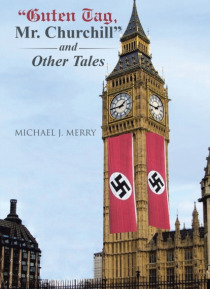 The title novella, Guten tag, Mr. Churchill, is an alternative history of WWII telling of the German invasion of Great Britain and how Churchills auxiliaries made their presence known. Finding Jimmy is another alternative story, which reveals details of Jimmy Hoffas disappearance. Jack tells of a young boy who joins the Navy in WWI and becomes a … national hero. Second Chance follows a remorseful robber and the journey which leads him to return his loot. The Lady is an alternative tale that follows a refurbished Seaford amphibian as it lands near an unmapped atoll and solves an aviation mystery. Ghostbusters tells of a previously unknown US government agency that tracks embedded foreign agents. Cohens empanadas takes the reader through the steps of robbing a safe-deposit company in Latin America. Two Priests tells of Steven and Paddy, boys who follows different vocations in the Catholic Church.